I am a selfish knitter. I admit it. Rarely do I knit for others, but that’s because I know myself. You see, I knit, a LOT. What I don’t do? Finish. Anything. In all of 2010, I finished one scarf. A scarf that I started in 2009. This year? Nada. Zilch. Nothing completed. That’s bad, right? Yeah, it kinda is. You see, my office has a longstanding tradition of charitable giving to one of the senior citizen homes in Washington, DC. Among other activities, every year, we host a Christmas luncheon for them, and everyone receives a gift of some sort–maybe playing cards, toiletries, etc. This year, it was decided that a handmade gift should be included in each gift. And it is no secret that I am a knitter. I’ve been personally asked to make something, and to tell all my friends. So, I’m doing both. There are not many rules… they’re collecting things that are “keep warm” type items, that don’t have to conform to a size. Scarves, small shawls, hand warmers, lap robes. That sort of thing. And they have to be made from a machine washable yarn. Someone in my knit group yesterday asked if she could make a lap blanket out of fabric, as she’s recently gotten back into quilting again. I certainly wasn’t going to say no to that! So, wow. I’m doing it. I’m making a scarf. Now, since the last scarf I made clearly took about a year, and this time I don’t have that kind of time, I have to stay focused. I have to stay dedicated. I have to get it done, this dang scarf, so I can say I got it done. 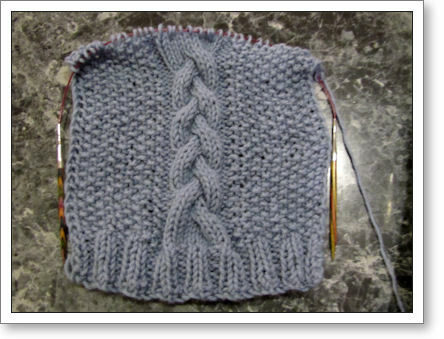 I decided to make it with seed stitch and an easy cable, so there’s just enough interest on every row to keep me going. So far, it’s working, but it’s only been 10 days. Wish me luck, will you? I’m SO really bad at knitting for Good. Even when that good thing is a small thing, it’s usually such a big deal. I can finish this one thing this year, can’t I? Or. make that two things. I’m also signed up to do a Special Olympics Scarf. Oh, boy, am I in trouble.